Included are wines from the finest Domaines in Burgundy, the great Chateau's from Bordeaux, Cult Cabernet from Napa, the best from Tuscany and Piedmont in Italy and tiny pockets of greatness from around the world. 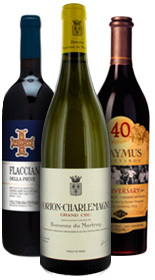 We handpick wines that have received 93 – 100pts by the leading wine critics in the world. We bring the wine cellar to your door. Ever wonder which wines are in those great cellars. Here is your opportunity to experience the greatest vintages, perfectly aged, hard to get, highly allocated wines. The wines that you don't see on your retailer's shelves, the insider wines, the single vineyard wines, the wines that you need to know somebody to get. The John Craig Society is fast becoming recognized as the ultimate fine wine club for discerning buyers. Great wine is “finite” by its nature. Membership is limited. JOIN NOW. Two levels of wine are offered. Both include the world's finest wines in their class from the leading wine regions in the world. It's your choice. 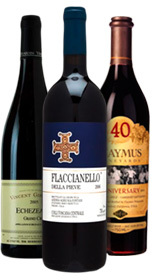 Selections have received critical acclaim from leading wine critics: Parkers WA, Wine Spectator, Decanter, Galloni and Suckling. Selections are hard to get insider wines and highly allocated. You are receiving these world class beauties in every shipment. Your wines arrive in 6 week intervals. FROM THE OPTIONS AVAILABLE, SIMPLY SELECT YOUR PREFERRED WINE GROUP, DECIDE ON PREMIUM OR SUPER PREMIUM AND CHOOSE YOUR 6 OR 12 BOTTLE PACK. YOU WILL RECEIVE 8 SHIPMENTS, ONE EVERY 6 WEEKS OVER THE NEXT 12 MONTHS. OUR EMAIL NOTIFIES YOU WHEN TO EXPECT DELIVERY. YOU ARE CHARGED AS EACH SHIPMENT IS MADE. 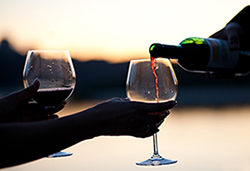 SHOULD YOU WISH TO MODIFY YOUR INITIAL CHOICE TO ANOTHER WINE GROUP, SIMPLY CALL US AT 800-434-WINE (9463) WITHIN 2 WEEKS OF RECEIPT OF LAST SHIPMENT. WE WILL EXECUTE YOUR REQUEST. The perfect prestigious gift personal or corporate. can deliver to different Locations. Rich Round Oak Long and Layered, The Finest Cali Chards, Great White Burgundy and More. The pinnacle of sophistication. 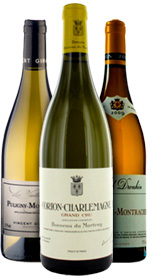 Meursault, Puligny, Chassagne Montrachet and more. The finest white wines in the world. This selection covers all the bases. Great red and white wines, all styles all regions. All choices covered with confidence. 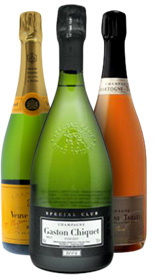 From the Grand Houses of Champagne to the tiny family Grower Champagnes. From Blanc de Blanc to Rose including great vintage bottlings. You receive it all, a bubbly lovers paradise. Choose your 6 or 12 bottle packs. You will receive 8 shipments, one every 6 weeks, over the next 12 months. You receive your shipments every 6 weeks. Our email informs you to expect delivery. You are charged as each shipment is made.